Happy news...I am off work this weekend!! I thought I would start off my day with creating with some of the new collage sheets I have in my Etsy. First I have this Sweet Vintage Victorian Girl with Roses Digi Collage Tag set below. 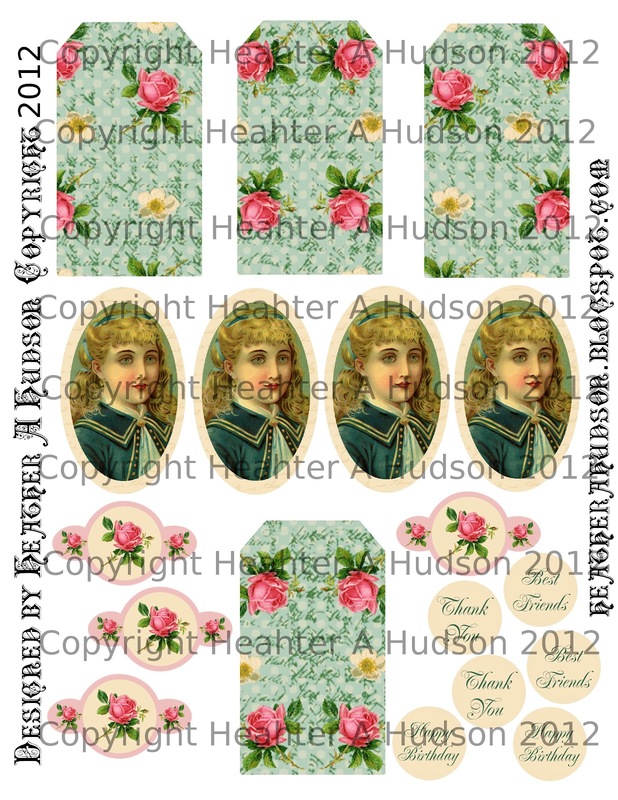 I created the background paper myself, and found the little girl image from the Graphic Fairy. Really Reasonable Ribbon, and the flowers and embellishments are from Pro 31 Designs. Anyone who purchases my Collage sheets will receive a code for 25% off their next Pro 31 Designs Order. Here is a video of how I assembled the tags. I will be playing along with Creative Inspirations: Bingo (I chose pink, flowers and polkadots (background paper)). 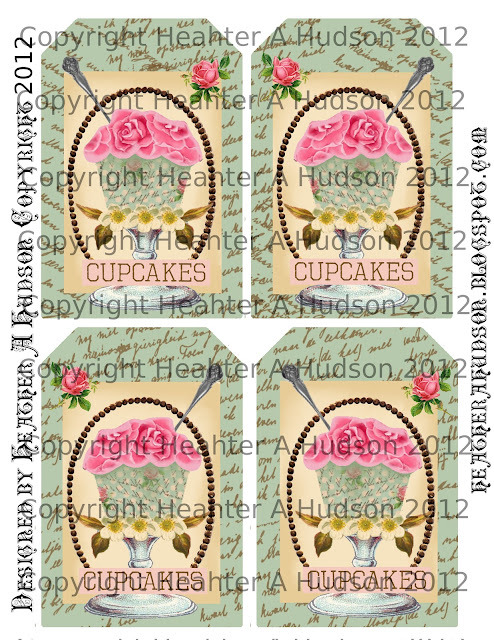 Here is another collage sheet I created using a Cupcake image that I painted in GIMP. I used the same background paper that I created for the tags above. I thought I would play along with the Our Creative Corner Challenge (recycle and pop of green) so I Recycled a chocolate cheerios box to give my picture holder below some weight. I also thought I would play along with this weeks challenge at City Crafter (bake sale). I simply printed out my CUPCAKE collage sheet, cut out the tags, and glued them to the box. Then I glued pink cardstock to the other side and trimmed the edges. Inked all my edges with Ranger's Vintage Photo distress inks. Finished it off with some more fabulous green vintage seam binding from Really Reasonable Ribbon, and embellishments from Pro 31 Designs. 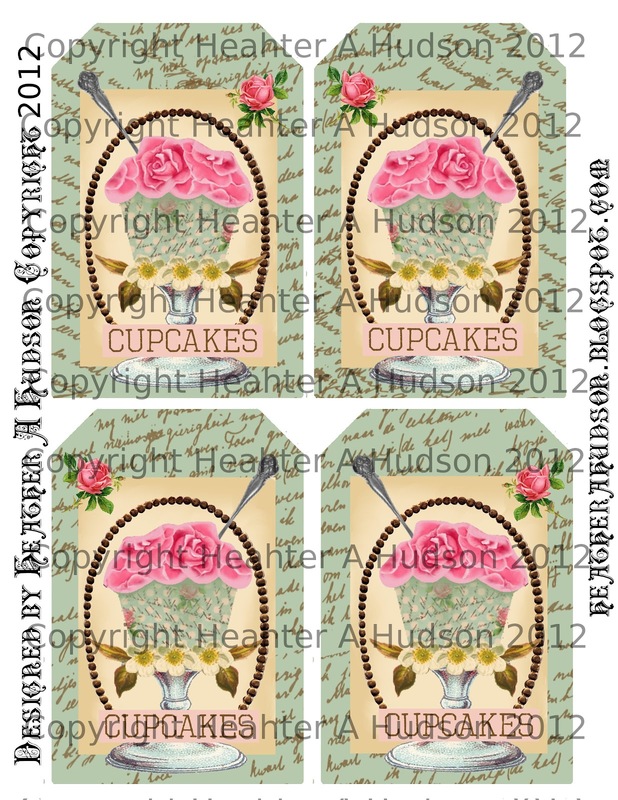 The cupcake image is one I painted myself, the tiny white flowers, leaves and cake stand are all parts of other graphic fairy images that altered. Love your new designs. The tags you created are really heart throbing!!! So soft and delicate. So sweet, thanks for playing along with us at CCCB! Oooooh your tag looks so yummy! Love all of the embellishments! Coming over from Brag Monday. I am a happy new follower! These tags are delightful. You are one talented lady to be able to design these tags and there are some lovely projects on your blog. So glad I spotted your tags and popped over from the make it Monday blog to take a better look. My entries are: #13 and #53. Hi saw your fab tags on The Graphics Fairy's Brag Monday. How did you tie the lovely green ribbon down the side of your tag? Gorgeous vintage creations Heather. I love both of them and thank you for sharing them with us at MIM! What wonderful tag.. I just love your design. Thanks so much for playing along with us over at CCCB! This is such a beautiful card. I am amazed at your creativity. The braided green ribbon is so inspiring - I just LOVE this! Thank you so much for joining us this week at Our Creative Corner.